For some time I've wondered about how much the "Drive Safely" signs posted around the city was costing Indianapolis taxpayers. Having ordered signs for political campaigns, I was somewhat familiar with what sign companies charge. In 2002, I ordered about 3,000 signs when I ran for Marion County Clerk, spending no more than $5,000. The one-sided Drive Safely signs though are a little different from traditional yard signs. They are made out of hard plastic which stand the weather better than the various materials used for traditional yard signs. 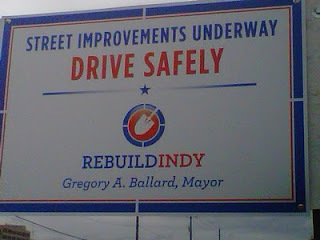 I consulted with a person who had been in the sign business for years about the Ballard Drive Safely signs. He was familiar with the signs. He said that even though the material was different than traditional yard signs, the pricing wouldn't be that different. He said the key cost was how many times they wouold have to set up and tear down the machine. The fact that the signs are of at least two, possible three different sizes would drive up the price a bit as they would have to reset the machine that inks the signs. My sign expert concluded that there was no way the 543 signs DPW said was produced could cost more than $10 each. According to the Department of Public Works, the City contracted with Firehouse [Image Center] for the signs. (I can't find the contract in the city's database and didn't receive an answer when I asked why it wasn't there.) There was 543 signs ordered at a price of $43,466.45. That's an astonishing $80 a sign. Most of the signs are simply attached to current traffic signs. (Which is undoubtedly illegal.) Others are placed on crudely constructed wooden frames. I was told that providing wood and the erection of the signs were done by contractors as part of the deal. (Firehouse probably would have contracted this out since it appears to just be a graphics company.) Still the wood and the work putting up the signs still would get it to nowhere near $80 apiece unless the workers are using limos to ride around town erecting signs while drinking champagne. The contract was apparently not put up for bid. According to the Department of Public Works, Firehouse "was chosen because they are the only local firm able to meet the City's need." My sign expert laughed when he heard that claim. He said there were sign companies all over the city who could have produced the signs at a much, much cheaper price. DPW did point out that the company is a certified WBE, with Sally Corman as President. Terry Corman is listed as the CEO. We taxpayers paid $80 each for signs that at best cost $10, signs, by the way, that were completely unnecessary. If Mayor Greg Ballard is truly watching out for taxpayers, as he claims, why would his administration enter into such a bad deal? Sing to the Signs song - "Sign, sign, everywhere a Ballard sign, blocking out the scenery, breakin' my mind Paying way to much, but baby can you read the sign!" My apologies to the Five Man Electrical Band, but I would think they would agree with the slight change in the lyrics. Good old Ballard wasting our tax money once again. The question is why can't the MBE match the pricing of a regular sign maker? It's just more stealing. It is what politicians know best. Your words are true and good. Ya done good. many thanks!